I’ve probably read “By the River Piedra I Sat Down And Wept” by Paulo Coelho at least three times before, and lately I had the urge to re-read it again, but I couldn’t find my paperback book anymore (my guess is someone borrowed it a long time ago and it never made its way back). I checked my options, buying a new paperback, getting an ebook, and trying my very first audiobook. I ended up doing the last one, and it was an interestingly different experience. I might try audiobooks of Coelho’s other books in the coming days. By the River Piedra I sat down and wept. There is a legend that everything that falls into the waters of this river – insects, the feathers of birds – is transformed into rocks that make the riverbed. If only I could tear out my heart and hurl it into the current, then my pain and longing would be over, and I could finally forget. By the River Piedra I sat down and wept. The winter air chills the tears on my cheeks, and my tears fall into the cold waters that course past me. Somewhere, the river joins another, then another, until – far from my heart and sight – all of them merge with the sea. May my tears run just as far, that my love might never know that one day I cried for him. May my tears run just as far, that I might forget the River Piedra, the monastery, the church in the Pyrenees, the mists, and the paths we walked together. I shall forget the roads, the mountains, and the fields of my dreams – the dreams that will never come true. I remember my “magic moment” – that instant when a “yes” or a “no” can change one’s life forever. It seems so long ago now. It is hard to believe that it was only last week that I had found my love once again, and then lost him. I am writing this story on the bank of the River Piedra. My hands are freezing, my legs are numb, and every minute I want to stop. “Seek to live. Remembrance is for the old,” he said. Perhaps love makes us old before our time – or young, if youth has passed. But how can I not recall those moments? That is why I write – to try to turn sadness into longing, solitude into remembrance. So that when I finish telling myself the story, I can toss it into the Piedra. That’s what the woman who has given me shelter told me to do. Only then – in the words of one of the saints – will the water extinguish what the flames have written. All love stories are the same. Son los locos que inventaron el amor ~ It must have been the lunatics who invented love. But love is much like a dam: if you allow a tiny crack to form through which only a trickle of water can pass, that trickle will quickly bring down the whole structure, and soon no one will be able to control the force of the current. For when those walls come down, then love takes over, and it no longer matters what is possible or impossible; it doesn’t even matter whether we can keep the loved one at our side. To love is to lose control. But love is always new. Regardless whether we love once, twice, or a dozen times in our life, we always face a brand-new situation. Love can consign us to hell or to paradise, but it always taks us somewhere. We simply have to accept it, because it is what nourishes our existence. If we reject it, we die of hunger, because we lack the courage to stretch out a hand and pluck the fruit from the branches of the tree of life. We have to take love where we find it, even if that means hours, days, weeks of disappointments and sadness. The moment we begin to seek love, love begins to seek us. I also knew that from this moment on I was going to experience heaven and hell, joy and pain, dreams and hopelessness; that I would no longer be capable of containing the winds that blew from the hidden corners of my soul. I knew that from this moment on love would be my guide – and that it had waited to lead me ever since childhood, when I had felt love for the first time. The truth is, I had never forgotten love, even when it had deemed me unworthy of fighting for it. But love had been difficult, and I had been reluctant to cross its frontiers. If pain must come, may it come quickly. Because I have a life to live, and I need to live it in the best way possible. If he has to make a choice, may he make it now. Then I will either wait for him or forget him. Love doesn’t ask many questions, because if we stop to think, we become fearful. It’s an inexplicable fear; it’s difficult even to describe it. Maybe it’s the fear of being scorned, of not being accepted, or of breaking the spell. It’s ridiculous, but that’s the way it is. That’s why you don’t ask – you act. As you’ve said many times, you have to take risks. I loved him. With every minutes that passed, my love was growing and transforming me. I once again had faith int he future, and little by little, I was recovering my faith in God. All because of love. If I have to fall, may it be from a high place. I think that when we look for love courageously, it reveals itself, and we wind up attracting even more love. If one person really wants us, everyone does. But if we’re alone, we become even more alone. Life is strange. I am going to sit here with you by the river. If you go home to sleep, I will sleep in front of your house. And if you go away, I will follow you – until you tell me to go away. Then I’ll leave. But I have to love you for the rest of my life. 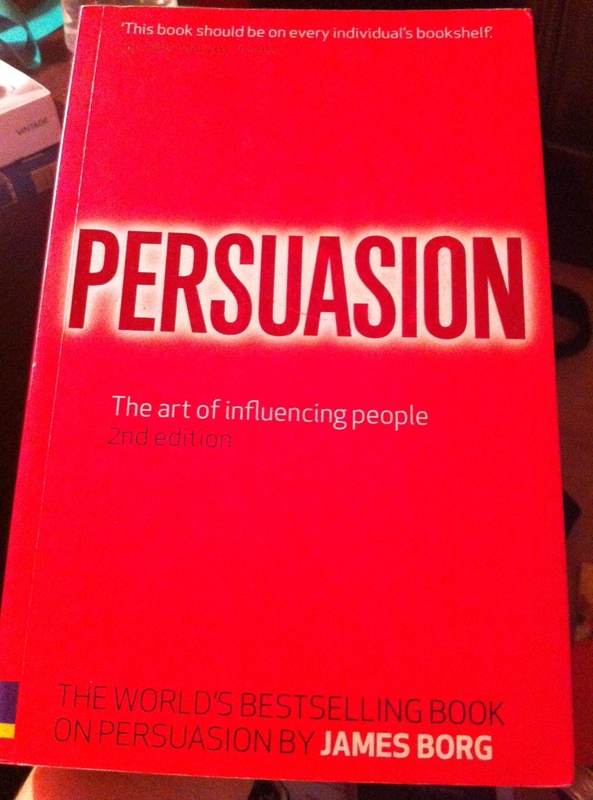 One book I have recently read is Persuasion – The art of influencing people by James Borg. It was one of the many books that my brother passed on to me last December. I am slowly going through all the books one by one, and this particular one caught my attention. I must admit that my personal skills have a great potential for development, and personal development books like these can be very interesting and possibly helpful in my constant goal to become a better person. Perhaps you may say that these lessons are much too simple and common sense. However, these are also things we usually forgo, forget, or take for granted. The book gives sample situations that show the negative and the positive of each aspect. From this, the book gives tips on how to act better and be able to avoid negative outcomes and approach situations with the aim toward the positive. I may still be a long way from being able to embody what I have read from the book, but at least I now have a push towards the better side of things. Possibly with awareness and with practice I will be able to be better, not just in the art of persuasion, but in communicating to others in general.